Boulevard skate company co-founder Rob Gonzalez has been pro for longer than most people have skated, period. He’s been shredding at Long Beach’s Cherry Park for even longer. Check him out skating in Boulevard’s latest video, Quinto, and peep what he has to say about his ties to this legendary park, below. The stage was the original spot we all skated. In the late ’90s, the park was super rundown and pretty rough. Skateboarders thrive in these kind of environments because you can skate in peace, and at the end of the day, the police have bigger fish to fry than a bunch of kids skateboarding in the park. At this point, a scene started to develop and the park became a place to go skate and hang out without getting kicked out. This was around the time we used to skate the tables down the stage—the ones Danny Montoya destroyed in Adio’s One Step Beyond. During that time, skateboarders had free reign, which was a blessing and a curse. Eventually, after years of unchecked juvenile delinquency, the neighbors finally had grass put around the stage, and a no-skateboarding ban was enforced. In defense of the skateboarders, because the park became a scene, a lot of the problems were caused by randoms, non-skaters, and lowlifes who were trying to hang out or be in the mix. The grass gap is still skateable if you feel like hucking it. Only a handful of skaters have really gotten down over the gap. The park is the crossroads for a lot of different neighborhoods in Long Beach. It basically sits in the center of the city. There’s a lot of kids around with nowhere to go and nothing to do. Before the park was built, skaters like Terry Kennedy, Evan Hernandez and Knox Godoy made it cool to start skating in Long Beach. Skateboarding gives kids purpose, family, and a sense of accomplishment. It’s a good alternative to gangs and drugs. Skateboarding was blowing up in the city during the early 2000s. Once the stage got shut down, it was a big blow to the LB scene. A lot of kids quit, since they had nowhere else to congregate and skate. The diehards moved across the street to the fountains, but there wasn’t anything to skate and we would still get kicked out. Eventually, we just started building DIY ledges on the slab of concrete where the shuffleboard courts used to be. After years of trying to rid the park of skaters, the city got the picture, and with the help of an ex-councilman named Mike Donelon, we officially turned the space into a skate park. At first, it was three cinderblock DIY ledges. Soon after that, we got some prefab elements donated. That was the start. We had a DIY spot up near the 405 Freeway, called LB FREE. At the time, we had just barged a bunch of cement trannys and ledges on an abandoned lot. The city shut us down so we took a couple of the ledges to Cherry. The first Cherry skatepark ledges were built by me, Matt Bennett, Austin Stevens, Danny Montoya, and Jose Pereyra. Cherry Park is made up of four small parks divided by two streets. Each small park serves its own purpose and has its own personality. The ocean bluff side of the park is the yoga/chill/watch-the-sun-go-down side. Across from that is the Mexican-soccer and BBQ zone. Next to that is the community center and skate park zone. Across from the skate park is the “prison workout” zone. Each park is completely different from the other, but they’re all Cherry. Everything to eat or drink is located on Broadway Ave. There’s Rite Aid for drinks and snacks on Cherry and Broadway; Hot Java [is] on Broadway and Junipero Streets for coffee and a bagel. Park Pantry, Fat Tomato Pizza, and Tru Nature Juice Bar are on Broadway. There’s also a farmers market in the park on Tuesdays and Saturdays. If you plan on skateboarding, the fewer valuables you have with you, the better. If you have a backpack, strap it to the fence. Leave your camera bag in the trunk when you’re not filming. Always skate with your phone in your pocket—don’t set it down while you’re skating. Not because of the skaters, but because of the lurkers. Only use the Cherry Park bathrooms as a last resort. [They’re] sketchy. There are so many pros who skate the park and live in LB that it’s hard to name them all. The ones that come to mind are Chad Timtim, Danny Montoya, Levi Brown, Julian Davidson, Nick Garcia, Jon Dickson, Carlos Iqui, Tiago Lemos, Matt Bennett, Austin Stevens, Carlos Ribeiro, David Reyes, Jamie Tancowny, and Brad Comer. Busy times are weekends and weekdays after 3 pm. Non-busy times are mornings, nights, and during school hours. The park is for everyone to enjoy, so come skate and have fun. Just always remember to pick up your trash and always respect the locals. 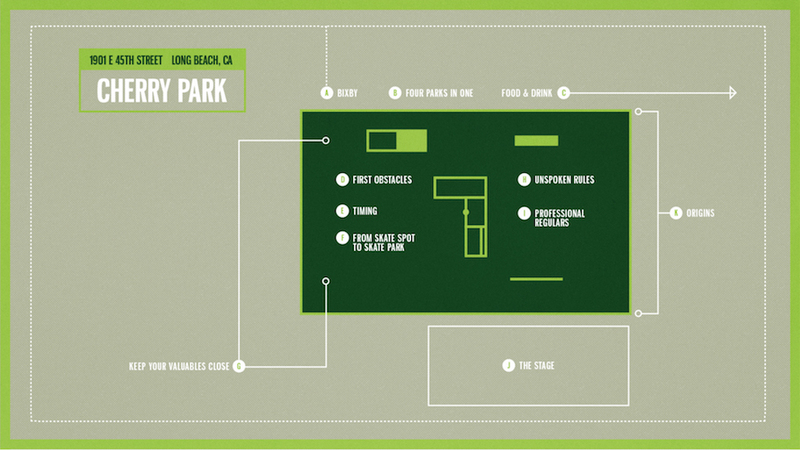 See more Annotated Skate Parks of America.